Let's skip the requisite preamble paragraph and get right to it. 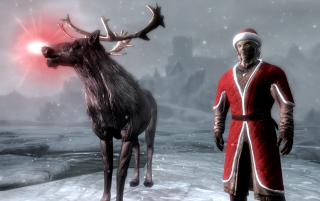 Here's the plan: in Skyrim, I'm going to use mods and console commands to transform my character into Santa Claus. Then I'm going to deliver gifts to every single NPC household in Skyrim. And I'm going to do it in a single night. Probably won't check it twice, though. As an aspiring Santa in Skyrim, I face a few challenges. First, a heavy workload. Even a quick glance at the Elder Scrolls wiki shows 115 NPC homes, and I strongly suspect there are more. For instance, the owners of stores often live in rooms above their shops, not in separate homes, so those aren't listed on that page. Cities have castles and palaces stuffed with NPCs who actually live there. There are orc strongholds, two Dark Brotherhood sanctuaries, a few mills that aren't listed, a couple lighthouses, and so on. For sanity's sake, I'm going to define NPCs as characters who have actual names. I don't plan to do forts or towers, for example: bandits, while naughty and deserving of coal, typically aren't named, and thus can't be on Santa's list. Same with guard barracks: guards are just guards, they have no outside lives that I'm aware of, other than gently mocking passing heroes. No caves, either: while there are some named NPCs living in caves, they're not getting presents because, look: don't live in a cave, okay? Shacks, typically, are inhabited by monsters, or dead bodies, or no one, so I'm skipping those as well. Following those guidelines, I've come up with my general route. Now, to look a bit closer at the details. Just by examining the city of Solitude and making notes, I've counted up 76 NPCs who need presents. Granted, many of them share lodgings, so I should be able to dump presents for entire families in a matter of moments, but that's still a lot of individual stops. More than I had really thought there would be. Which means I really need to do something about the duration of Christmas Eve. First of all, vanilla night is not nearly long enough: the day/night cycle in Skyrim is set at 20:1, where every minute of real-time equals 20 minutes of in-game time. Using the console command 'set timescale to 1' makes the passage of time in Skyrim identical to real-time. Provided I start at 8:00 p.m., and plan to be done by 8:00 a.m., that should give me enough time for the trip. Quick! Before I decide this is a terrible idea, let's turn me into Santa. Using a new character, I begin by getting in the mood with a little santa cosplay. I found this Santa hat mod, which places a Santa hat (actually, 1000 of them) in a barrel inside Dragonsreach. That's a good start. I also avail myself of a bright red Santa coat with another mod. As magical as Santa is, I'm still going to refrain from using fast-travel, but I'll make up for it by traveling fast. I use the console code 'player.forceav speedmult' and set it to 800 (the normal movement speed is 100). That makes me fast. Real fast. A test run, however, gives me a new problem. As you can see, whooshing around Skyrim like Quicksilver means I can very easily fling myself off a cliff and die from the impact. I'm tempted to just use God mode —Santa is of course immortal—but being immortal, in my mind, doesn't mean you can't be killed, just that you won't die naturally from aging. So, I just boost my health to 10,000 using another console code. I also lower my speed back down to 200: that will keep me fleet but I'll still be able to stop easily enough to open doors. Speaking of doors: how will I get into all of those homes? It's not like I'm going to skulk through the world pick-pocketing the house keys off every single NPC in advance (though, note to self, I should do that sometime). I sure as hell don't want to play the lock-picking mini-game all night. So, I'll do it the same way a morbidly obese elf traditionally fits down a chimney: with magic. I find it a little lame that Skyrim doesn't have a simple Knock spell, which should reside in every magician's bag of tricks, but as with everything, there's a mod for that. This mod lets me cast an Open Lock spell and then crack open a door in short order. Now that I dash from door to door, and open those doors without lockpicks or keys, there's the question of quickly getting between towns and cities. That's where Rudolph comes in, via another mod. I can summon him with a spell, hop on his back, and fly through the air. Perfect! I also increase his movement speed with another console cheat. It actually works better than dragon-riding does. Another issue pops up. If I'm doing this at nighttime, when everyone is at home all snug in their beds in their kerchiefs, caps, and full plate armor, it's going to be dark, possibly very dark. Not only will this make it tough for me to find my way around, but it's going to make for some terrible screenshots. Thankfully, yet another mod gives me a spell to control the weather, including changing it to Sovngarde conditions, which are bright and magical and even shower down little sparkles that look like snow. It's beginning to look a lot like Christmas! I also install a lovely UI mod to help me keep track of the time on-screen. It adds a widget that displays the current time, including a little graphic showing the moon in the sky. Perfect. Next, I mull over my gift options. It would be in keeping with tradition to actually craft the presents, but I don't want to spend hours standing at a forge, and I don't have an army of unpaid elves to do it for me. So, I rush around to every store in Skyrim, buying the best in armor, weapons, clothing, potions, ingots, and jewelry. I also acquire some charcoal in case I come across anyone naughty. Naturally, to carry all this loot I need to increase my carryweight ('player.setav carryweight 10000' oughta do it). Okay! I'm ready to spend the night breaking into people's homes all over Skyrim. What could go wrong? They... don't want to sit in my lap, do they. Next time: a bunch of things go wrong. Continue to Part 2.